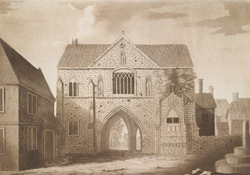 View of the gatehouse at Worksop abbey, also called Radford priory. This is one of two views in the King's Topographical Collection of Radford sold by I. Chapman. There is a market cross just outside the gatehouse, suggesting that this was once the town centre. The abbey was founded in 1120 by William de Lovetot for the Augustinian order. The gatehouse itself is a broad, solid mid-14th century building. John Byng, Viscount Torrington, visited Radford Abbey during a tour of the Midlands in 1789, noting: "in front of the gateway whereon is much curious carving, and antient sculpture, is an handsome reminder of a cross, on which we sat for some time, ruminating on this scenery of former grandeur."